Our house has a heating system from the 1950s. We stopped using the ancient oil furnace when we installed our woodstove. I thought that I did a good job sealing up all the unused heat registers but I was wrong. This heat register was hidden under our bed. One day I was fiddling around in there and felt a very chilly draft coming from under the bed. When I moved the bed, I discovered this frosty scene. Normally, in this type of weather, the furnace would be running all the time and blowing hot air through this “duct.” Ice would not have a chance to build up like this. 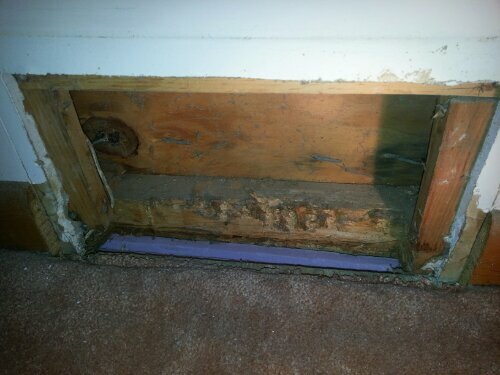 But for this entire heating season, this duct has been disabled and cold air has been leaking in through the gaps in the framing. 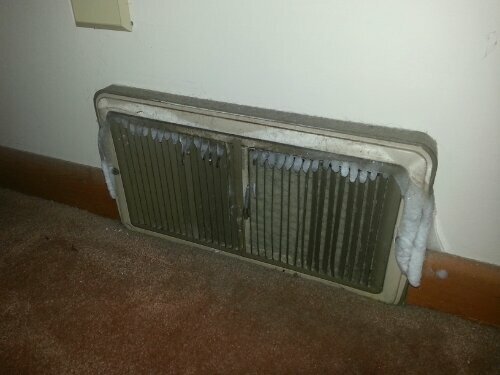 The warm, moist air in the bedroom has been condensing and then freezing to the cold metal grate. That’s how you can get icicles forming under your bed! This particular duct connects to crawlspace below the master suite addition. 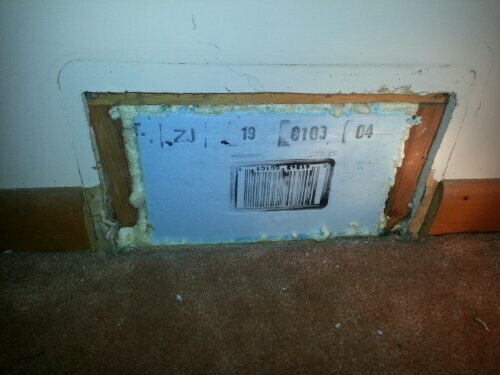 When we insulated the crawl space, I sealed up the bottom of the duct, but forgot to address the area behind the grate. This 2×4 exterior wall cavity was used as the heating duct. If you have heat registers in your exterior walls, you too might have a very large thermal bypass without even realizing it. Since our forced hot air system is no longer being used, I blocked off the duct, filled it with rigid foam board, and sealed up the gaps with a can of expanding spray foam.